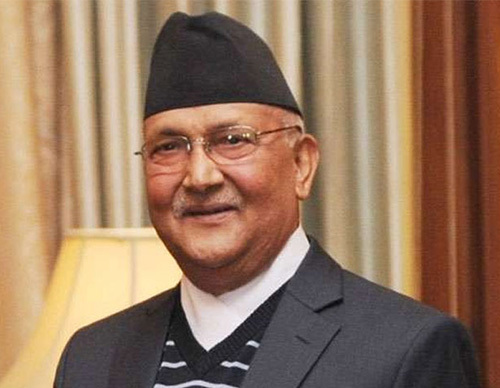 Kathmandu : Prime Minister KP Sharma Oli has floated a proposal for making a comprehensive plan for the overall development of Tarai. The PM broached this proposal during a meeting with the leaders of the Rastriya Janata Party Nepal (RJPN) at his official residence in Baluwatar here on Thursday evening. He proposed formulating comprehensive plan for the development of the Tarai, concrete steps for the conservation of the Chure region, construction of embankments and establishment of industries, among others, Chetan Adhikari, the Prime Minister's press coordinator, said. "There is also a need to change the mindset for Tarai's overall development," Adhikari quoted the Prime Minister. The PM stressed on the need of addressing various problems like the low literacy rate and other social anomalies besetting the people of the Tarai. The Prime Minister informed the RJPN leaders that since the People Housing Programme that was introduced during his earlier premiership was found not effective, the government was now planning to develop integrated settlements in Tarai also instead of the programme. On the occasion, RJPN leader Mahantha Thakur handed over a memorandum to the Prime Minister. Accepting the memorandum, PM Oli had said some of the demands which RJP had raised before have become irrelevant. "Several of the past demands have become irrelevant at present. You people also please rethink over them," he said. Regarding the queries related to amendment to the constitution raised by RJPN leaders in the meeting, Prime Minister Oli said the constitution would be amended as per the need and relevance. "Let us discuss on the shortcomings seen in the constitution but not get entangled only on this issue. Let us work for the country's development," the PM insisted. The RJPN leaders discussed with the Prime Minister on various topics like the problem of flooding in the Tarai, the status of the people injured in course of the Madhes movement and cases against those participating in the movement, development of the Tarai, the report submitted by the investigation commission formed to look into the Madhes and Tharu movements and constitution amendment.